PRESCOTT ­ An immense tract of ranchland that adjoins three tri-city area communities officially changed hands this week. The Granite Dells and Point of Rocks, two historic ranches northeast of Prescott, became the property of the Granite Dells Ranch Holdings LLC on Tuesday. Scottsdale-based Cavan Real Estate Investments leads the holding company. At 16,390 acres, the purchase comprises 25.6 square miles of land, nearly two-thirds the size of the City of Prescott's current landmass. By comparison, the city's largest recent development, Prescott Lakes, included about 1,100 acres. In a press release from Cavan Real Estate Investments, company founder David V. Cavan said, "We are at the beginning of a very long process for careful master planning and development." As for whether the planning and development will take place within either the City of Prescott or the Town of Prescott Valley's boundaries, company spokesman Al Bradshaw said the group is "looking at different options for development of the property." He added: "(The company) can't decide (to seek) annexation anywhere until they know how they're going to develop the property. There are so many possible options." The time frame for the master planning and the development also is uncertain at this time, he said. "There is no reason to make a timetable," Bradshaw said. For years, the two ranches have been the topic of heated community debate, as Prescott, Prescott Valley and Chino Valley have all eyed the area for possible future development. Currently, the bulk of the acreage lies in unincorporated Yavapai County, except for about 5,200 acres, which the Town of Chino Valley previously annexed. In the early 2000s, the City of Prescott entered a development agreement with the ranch owners, which set out the terms for annexation into Prescott city limits of about 7,000 acres of the two ranches. That agreement came under fire during the city's 2005 City Council election, however, when a number of candidates maintained that the agreement was harmful to the city ­ especially the portion spelling out Prescott's obligations for providing water to the development. Ultimately, city officials backed off from the agreement, and council members agreed that a new, reworked agreement was in order. On Wednesday, City Attorney Gary Kidd said he agrees with the view of former City Attorney John Moffitt, who had maintained that the agreement was only a preliminary document and would not become operative unless the city were to annex the ranchland. Before that could happen, he said, the city would require more planning and a more detailed agreement. This week, Kidd said, "The annexation agreement is not effective. That hasn't changed." He added that he has had no recent contact with the landowners. "They could present a plan for a new pre-annexation agreement at some time, but it's not on my desk right now," Kidd said. City Manager Steve Norwood said he also had not heard from the ranch owners recently. Even though he said he believes the next move is up to the owners, Norwood added, "We still have a high priority of getting this annexed into the city. If they're going to develop, we want it within city limits." In January, the Prescott City Council included the annexation of the ranches on its list of top priorities for the coming year. Both Kidd and Norwood stressed that any future annexation would have to follow the guidelines of the Reasonable Growth Initiative, a proposition that voters approved in November, which increased the time requirements for public involvement, as well as the level of council support necessary for large annexations. The Granite Dells and Point of Rocks ranches have been under the ownership of the Wilkinson family for more than eight decades, according to the company's press release. 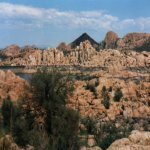 Incorporation of Granite Dells Ranch occurred in 1924, and Point of Rocks later formed as a separate corporation. Speaking for the ranches, Nicola Johnston said, "While it is with some emotion that we sell the ranches after all of these years, the members of our family corporations agree that it is time to pass on the reins of stewardship." Cavan Real Estate Investments formed in 1976 and has since completed residential and commercial projects throughout the Southwest, including the Seven Canyons project in Sedona. The company has declined to release the price and other details of the purchase.